Diary Spent our first full day in Cairo getting Sudanese visas. A bit of a paper chase and at 100 USD each ($600!) is a little on the steep side…tried the “half price for kids? plea, but to no avail. Also had to pay £20 for a letter from the British Embassy saying “British citizens don’t need a letter from the embassy” Ah the clear and simple world of international diplomacy! 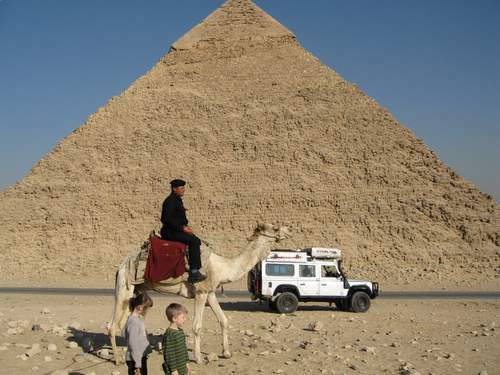 All sorted and need to be out of Egypt by 28th Feb at the latest and since the ferry from Aswan to Sudan along lake Nasser only goes once a week (on Mondays) will try to get there with time to spare in case we can’t get on the first one. I’m looking forward to the Sudan although my knowledge of it is restricted to Corporal Jones’ pontifications and a few books I have read about international aid scandals and the sorry saga of General Gordon…hope we have a better time than he did!